In October of 2009, the United States posted a national unemployment rate of 10.2%. The last time that the unemployment rate was 10.2%? April of 1983. In late 1982, the national unemployment rate in the United States peaked at 10.8% (both November and December saw unemployment rates of 10.8% that year). Three months after the United States posted a national unemployment rate of 10.2% in April of 1983, the rate finally sunk below 10% and stayed there until October of 2009. I thought that it would be interesting to look at the state unemployment rates for April of 1983 and October of 2009. Which states are suffering now that weren't suffering back then, and vice versa? State | 04/1983 Rate | 10/2009 Rate | Diff. West Virginia - 18.1% unemployment rate then, 8.5% unemployment rate now. Back then, West Virginia was a one-industry state (coal), and the recession greatly reduced the demand for coal. Unemployment in the state surged to almost Great Depression levels. Pennsylvania - 12.8% unemployment rate then, 8.8% unemployment rate now. Michigan - 15.6% unemployment rate then, 15.1% unemployment rate now. If you thought things were bad in 2009, they were even worse in Michigan in 1983. Sky-high gas prices, reduced domestic demand and increased foreign competition for automobiles conspired to drive unemployment rates higher in Michigan in 1983. California - 10.5% unemployment rate then, 12.5% unemployment rate now. A 2% higher unemployment rate for the most populous state in the nation? That's a lot more people that are out of work. Mississippi - 13.7% unemployment rate then, 9.8% unemployment rate (below the national average) now. New York - 9.0% unemployment rate then, 9.0% unemployment rate now. 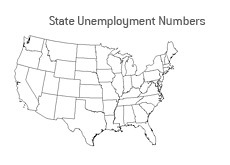 The only state with the same unemployment rates in both April of 1983 and October of 2009. So what does this prove? No idea, however some of the data is pretty interesting..